Monday both of my girls turned in reading fair projects. They had a lot of fun making them. This is the third year the Princess has submitted a project and Boo's first year. Over the past three years I have learned that the more interested the girls are in doing something, the more involved they want to be. 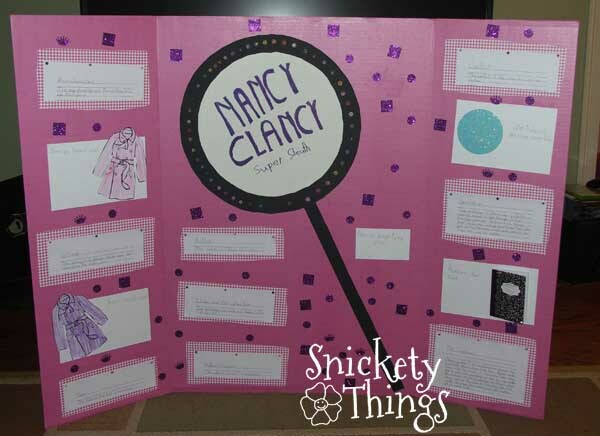 This year the Princess picked the book Nancy Clancy Super Sleuth by Jane O'Connor. If you have been reading the blog, this book choice may not surprise you. If you haven't been following, her kindergarten (she won 3rd place) and first grade (2nd place) projects were both based on Fancy Nancy books. 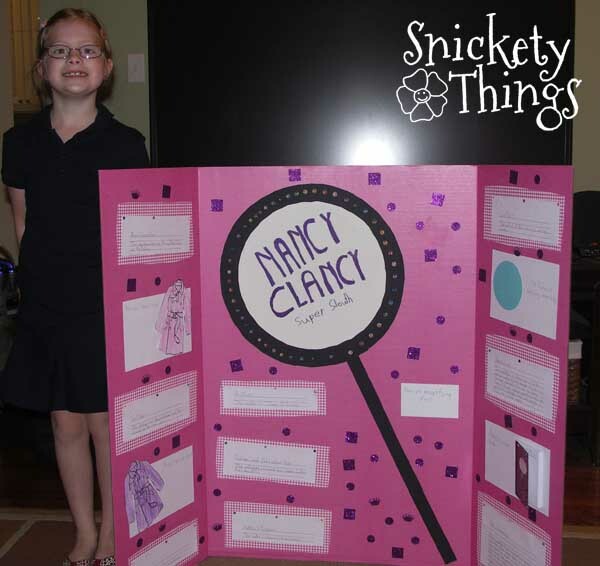 Nancy Clancy is the next step of Fancy Nancy. Nancy is a little older and starring in her very own chapter books now. Here is how her board turned out. After her other projects, she was able to do this one almost completely on her own. She was really proud with how her magnifying glass turned out. She used two of my pizza pans to trace circles. I just printed out the ruled paper for her and peeled jewels off of some backing paper (they were really stubborn). Here she is with it. She was so happy with how it turned out. 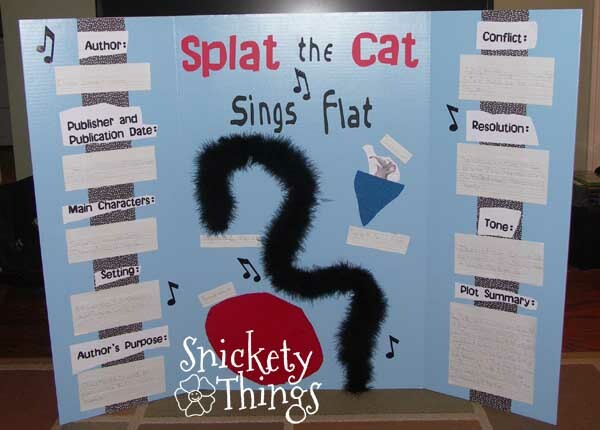 Boo chose to do her board on Splat the Cat Sings Flat based on the Rob Scotton character. The story was actually written by Chris Strathhern. Being younger, Boo had a little more help with her board. We printed up her category titles but she hand wrote all of the information. I also cut her title letters for her with my Cameo and I had to use big people scissors to cut the fabric pieces on it. She cut the other stuff out, can you tell? I just had to ignore my OCD tendencies to just go behind her and fix the jagged edges. Here she is showing it off. If you are wondering how they did, take a look. 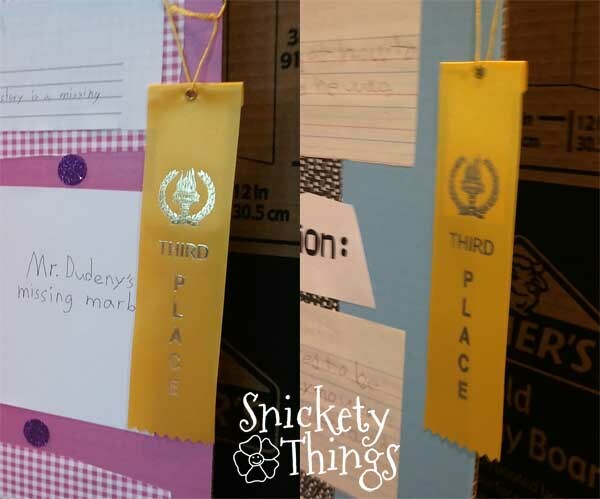 Both of them won third place for their grade. That means the Princess has placed all three years and it looks like Boo might be well on her way. 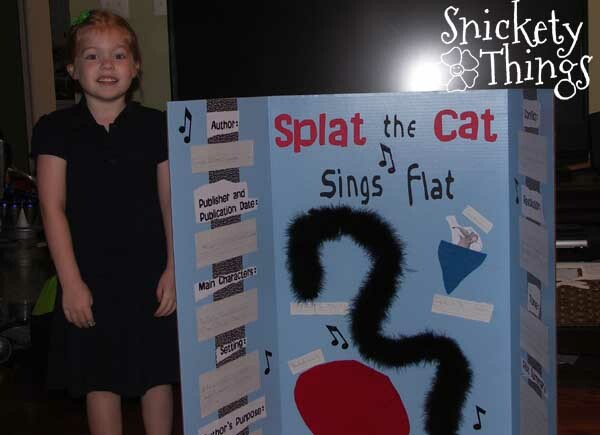 Does your child's school do reading fair projects? How fun! Yes, we do the Reading Fair as well! Congrats on your girls' boards! They look so proud and did a great job! Make sure you post pictures of yours!